Goodyear Wrangler Tires with about 1/2 life left - one tire has a plug in the sidewall and probably not usable. 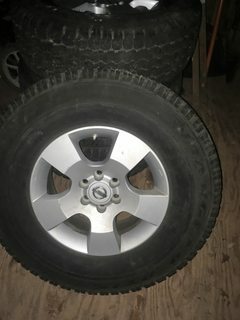 16" wheels in very good condition. Make an offer - in Charlotte, NC. Bump...need to sell these. Willing to accept any reasonable offers. Thanks! It might help if u posted the exact size. Different trims had different sizes. Off-the-cuff it looks to me they might be off a SE Offroad yes? It would be a 16x7" 5-spoke wheel, 6-lug, 4.5" bolt circle with 30MM offset made by Alcoa.